July 2011. Brotherhood of The Wind/ Motorcycle Road Culture in America. Mesa Verde National Park, Colorado. Don Borkenhagen, 63 and Diana Brice, 59, from Missouri on a Honda 2010 Goldwing Trike (a motorcycle on three wheels). Recently reconnected thourough match.com where Diana claims 80% of available men have a profile picture of themselves with their motorcycles. 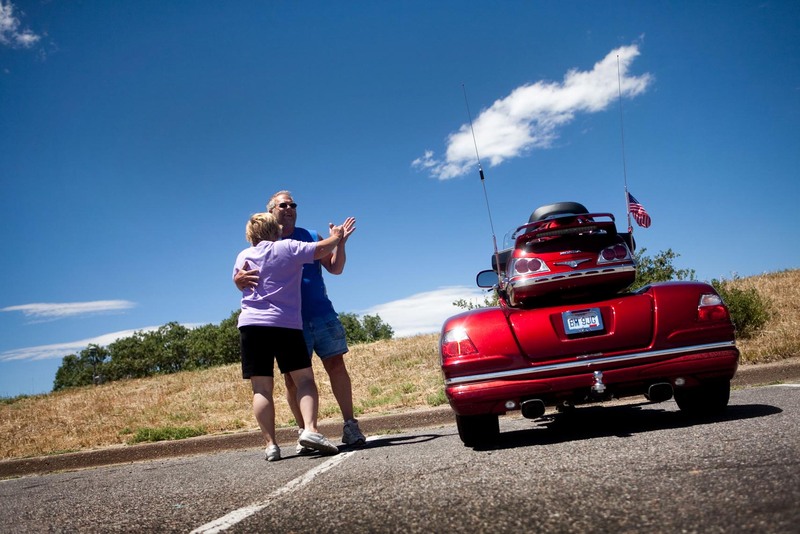 The couple was on an RV journey on which they also brought his motorcycle for extended daytrips. "We've been thinking about joining Bikers for Christ, their local Missouri motorcycle interest group. Diana joked about starting a blog named "helmut hair" and Don said that "Riding a moto is like walking behind a horse, don't do it unless you know that horse". Here, the couple dancing to "How great thou art" by Elvis Presley. Piotr Redlinski for The New York Times.